The Matilija Dam Ecosystem Restoration Project is intended to restore the Ventura River watershed through the removal of the obsolete Matilija Dam. Constructed in 1948, the dam has trapped 6 million cubic yards of sediment and contributed to the decline of the endangered southern steelhead. The primary technical issue is management of the sediment that has accumulated upstream of the dam. Wells - drill 2 new water wells at Foster Park for the City of Ventura. The Recommended Plan from the Feasibility Study. The fundamental challenge with dam removal is sediment management. In the case of Matilija Dam, this consist of 6 million cubic yards of silt, sand, gravel, and cobble. 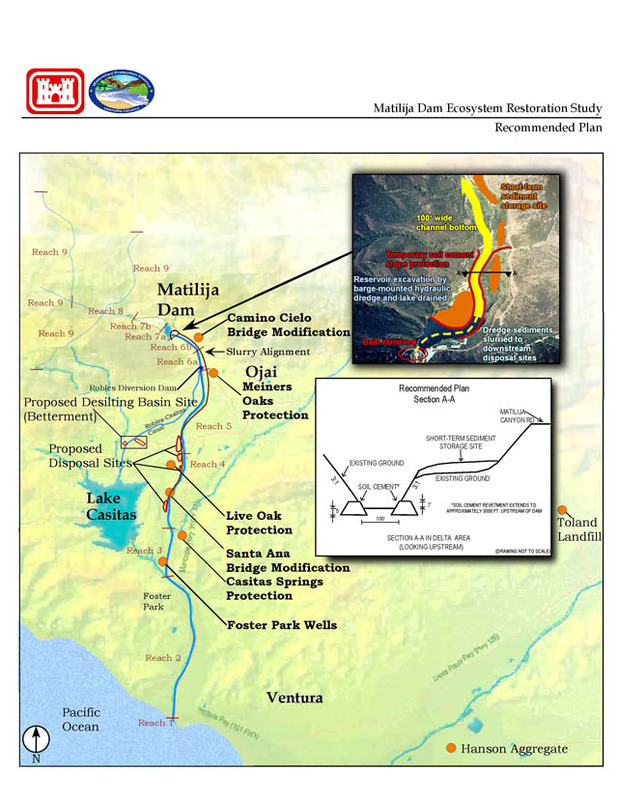 See Removing Matilija Dam for a summary of the problem. The Feasibility Study determined that “Full Dam Removal with Short-Term Sediment Stabilization” was determined to be the best overall concept, given the watershed hydrology and constraints. The primary design constraint is floodplain development downstream of the dam. Residences, roads and bridges, and water supply facilities all need to be protected under any project alternative. 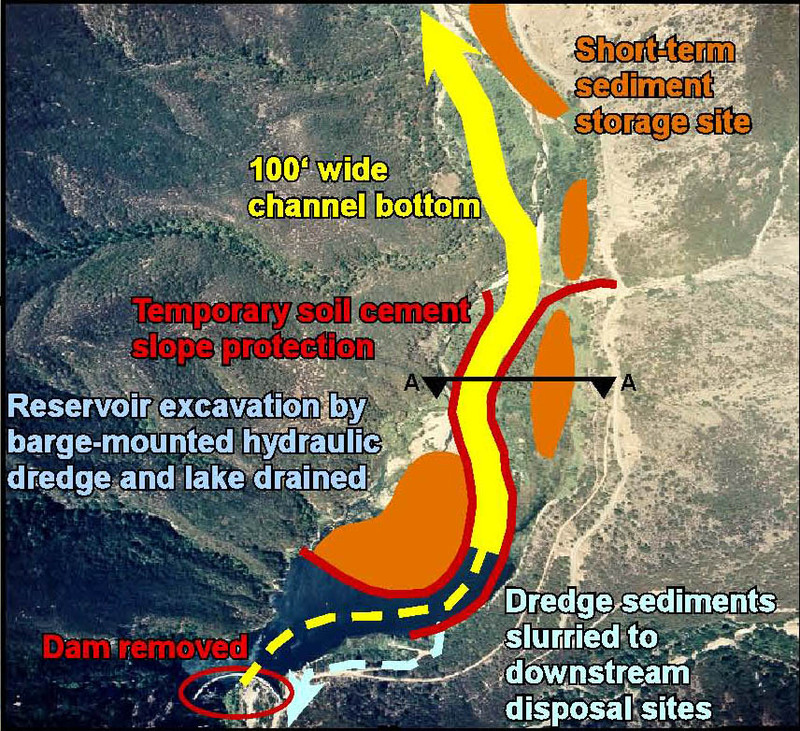 Approximately 2 million cubic yards of fine sediments currently trapped in the reservoir area will be slurried downstream (see Slurry Disposal below) The remaining 4 million cubic yards will be stored upstream of the dam site as illustrated below. The Matilija Dam Ecosystem Restoration project plan will allow for full dam removal with controlled sediment release. Environmental benefits are maximized, including renewed public access to Matilija Canyon, while the potential downstream impacts are minimized. The sediment management plan for the removal of Matilija Dam includes using a slurry pipeline to transport approximately 2 Million Cubic Yards of fine silt and clay to locations downstream of the Robles water diversion facility. The figure below shows a conceptual alignment for the slurry line. This was also conceived as a potential recreational trail to follow the alignment of the slurry pipeline after the fine sediments from Matilija reservoir have been removed and deposited downstream. The Feasibility Study 'Recommended Plan' identified 5 disposal sites, now known as Baldwin Road Disposal Areas (BRDA) downstream sites. (Left hand figure) a single site identified as the Meiners Oaks Disposal Area (MODA.) The figure on the right is from the Draft Recommended Plan from February 2004 describingthe Meiners Oaks DisposalArea (MODA). This was originally a 90 acre/15-20 ft deep disposal site below the bluff along Rice Rd. Recent and ongoing studies by the Corps of Engineers, Bureau of Reclamation, and Ventura County are aimed at determining the preferred site (or sites) for slurry disposal. The Matilija Dam Project includes modification or construction of three levees downstream of the dam site. These are located at Meiners Oaks, Live Oak (Oak View) and Casitas Springs. These figures show the historical river channel migration since 1947 and location of tributary inflows. The alignment of proposed levee is shown in the figure on the left. Green lines represent existing flood control channels. Bridge modifications will be required at Camino Cielo and Santa Ana Rd. At Camino Cielo a new bridge will be designed and constructed. Downstream at Santa Ana Rd the bridge will be widened by adding a new passage on the left (Oak View) bank. The intent of the high flow bypass modification to the Robles Diversion Dam is to solve the problem of sediment accumulation. The Feasibility Study included a proposed new radial gate structure that would open during high flow events to flush sediment downstream. The figure below shows a variation on this from the Value Engineering Study on the ROBLES DIVERSION PROJECT Ventura River Basin, CA June 2007. Physical modeling was showcased in Denver on Feb 11, 2008. The habitat assessment (HEP) analysis predicted that without management the non-native Arundo donax, or giant reed, would invade the floodplain, forcing out native habitat and wasting the valuable water supply. Comunity concerns regarding the large quantities of herbicide (glyphosate) that have been used to remove the mass of plants.